For anyone who knows Sister Demetria Smith, it’s not surprising how she wants to celebrate her 60 years of religious life today. She wants to thank all the people throughout the archdiocese who helped her support the mission efforts of the Catholic Church in Africa. “I’ve been going to the churches in the archdiocese all these years, and the people have always been very welcoming, very generous and very concerned about the people in Africa,” says Sister Demetria, an Indianapolis native who is a member of the Missionary Sisters of Our Lady of Africa and a retired mission educator for the archdiocese. Since she retired from the archdiocese in early 2013, Sister Demetria has been caring for a now-97-year-old woman in a nursing home. That spirit of caring has marked her religious life since she professed her vows on Aug. 15, 1954. 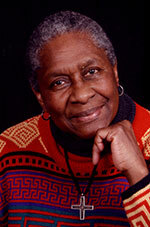 She served several stints as a nurse and a midwife in Uganda, including a time when she trained other nurses there. She also served her religious community in the United States, including a mission education assignment in Washington. That experience paved the way for her becoming the mission educator for the Mission Office in the Archdiocese of Indianapolis in 1995. Part of her duties involved traveling to parish schools to teach students about the work of the mission office and the cultures of different countries. Now 82, Sister Demetria credits her parents and siblings for helping to instill the Catholic faith in her life. She also had one more thank you to make for her 60th anniversary.